I've had 50 for a few years now. When I first got it I had an iPod and I'd turn it on when our volunteer fire whistle blew or when the police went flying by. I used it during last years flood to hear what was going on. I had a real scanner years ago and wanted to buy a new one but it was just more than I could afford. When it came time to up grade my phone I went with a smart phone instead if a flip phone just so I could have access to this app in my car. I listen to it instead of the radio , I line to know about wrecks up ahead and about crime going on in an area I might want to avoid. I've recommend it to many people. I've been happy with this app from the start. The fee is well worth paying for upgrading to the pro version, not only because it's ad-free but also for all the fun bonus feeds that come with it. My only disappointment is that I have a few (mostly local) feeds that indicate their on-air status as available, but are almost never able to stream. I suppose this could be an issue with the feed source itself and not the app, so I haven't let that issue affect my overall opinion or rating. 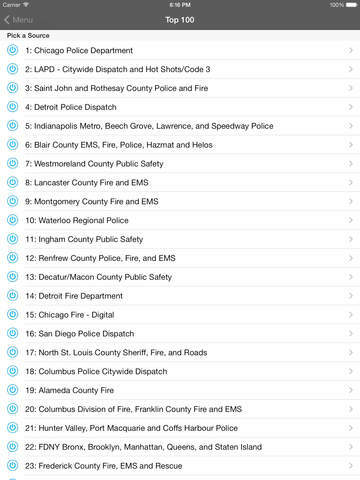 Also, this app is fun - who else doesn't enjoy being nosy about where those sirens you just heard are heading? 5-0 Radio Pro is an amazing app, and well worth the $3.99, but one problem I find with it is that the recording feature that's supposed to let you record live radio broadcasts just doesn't seem to work for some odd reason or other. It could be a nifty feature to have, but only if it's actually present in this app. 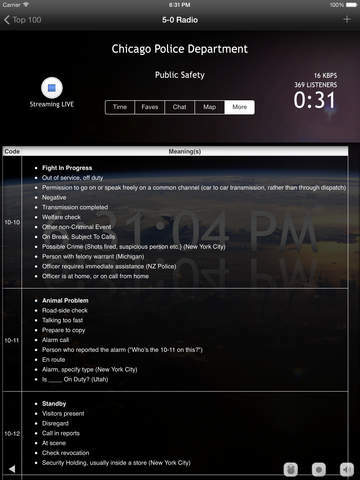 I know this was last updated in April 2015, but if Smartest Apps LLC could get right back to updating this app, any bugs or glitches related to this issue and more would be fixed, and then the app would be nearly perfect! I listen to local only stations, but love knowing what the issues are in our town. My son-n-law is an officer and I can see trials and tribulations the officers incur day in day out. I am enjoying the EMS/Fire, Sheriff Dept. as well since they are all listed together. I wish I was able to identify immediately which dept. is broadcasting. I usually can determine from locations, but not always. It would be nice to select a single department only. The app has worked great and I have recommended it to friends. It is a great service to those who have an interest or need to listen to calls. Most of the time there are 24 + listeners. If you know the frequencies of the organizations you want to listen to, then a "real" scanner is for you. However, if you don't, then this is your best bet for finding out what is going on. My pet peeve is, it covers the railroad I want to monitor, but not the section I'm interested in. I live in the north; it just covers the south. I have to try to figure out if the trains I hear are coming my way. 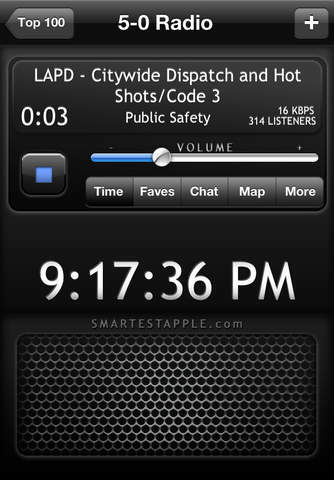 But, for local 911 and other civilian channels, it does a right fine job of keeping me informed. Either way, it's a worthwhile purchase. Remember 30 years ago having to buy 'crystals' for your 4-channel hand held, or the 10-channel desk model that were pre-set to various PD frequencies? LOL ! Those days have long passed, and what's great, the available phone apps that brings you all the action from around the world! This app is satisfying in every way. No more buying high dollar scanners when this App turns your phone into a multi-state, multi-city, multi-agency scanner! You will NOT be disappointed! Works great, looks great! Some communications get cut off or just don't transmit. I've noticed that on a few different feeds. No idea if its the app though, just sayin. Very handy. Some distortion. Cuts off at times. But, I do enjoy very much. This updated fixed everything I needed it to! GREAT app!! Need feeds for all of Laurens,SC. I would greatly appreciate it. Otherwise it's a completely useless app.